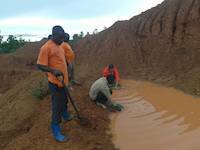 The gold panning is most important method for gold prospecting and recovery of final gold from concentrates. On this mining site we are gold panning for particles of gold in the overburden soil. 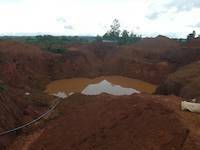 The open pit itself contains a lot of rich gold ore and operation requires more capital. 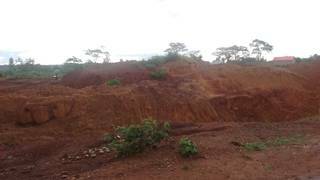 However, the overbuden soil and the tailing may create potential to recover good quantity of gold in a month. 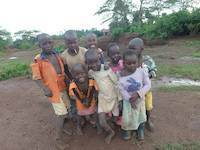 Children found on the mining site are warned and advised to refrain from playing on unsafe location. 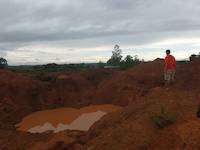 Mr. Louis is standing here on the top of the overburden soil from the open pit where exceptionally rich gold ore have been found. 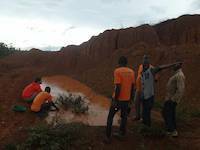 Here we are verifying the overburden for gold particles. In each shovel gold particles may be found, sometimes 25-30 pieces of smaller than 70 mesh. 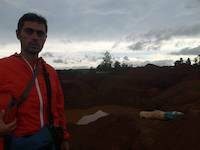 This type of overburden may be quickly processed similarly like tailing heaps that are laying around this mining site. 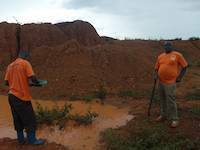 The hand lens is used to inspect for smallest gold particles in this overburden soil. 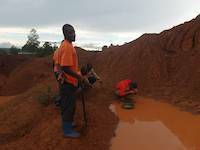 These boys are panning for gold on the open pit. The overburden itself contains particles of gold. 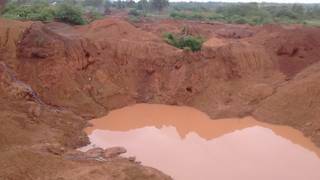 While the rich gold ore contains as much as 2 kilograms of gold in 3 large trucks of material. 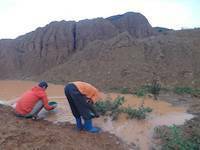 We are gold panning the overburden soil to verify for its existence of gold. Sometimes 20-25 particle in a pan are visible, indicating small quantity of gold. This is the open pit with rich gold ore under there. 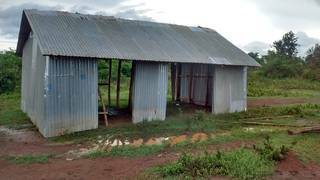 This is the future headquarter on the mining site. 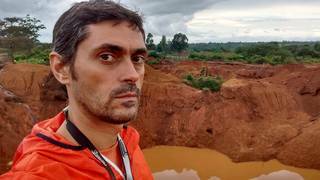 I may be looking serious on this picture, yet this picture is showing you that I was directly on the open pit we are here speaking about. 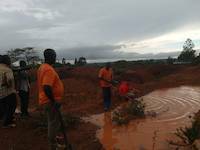 In general and in small scale we are able to help any mining site that wish to increase their outputs.